Welcome to Eyes of the World serving Eugene, Springfield, Cottage Grove, Creswell, Junction City, and Pleasant Hill, Oregon. 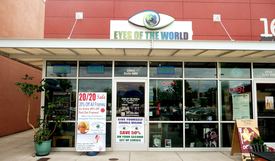 Eyes of the World is located in South Eugene, in Woodfield Station, 28th and Willamette, next door to Market of Choice. Plenty of free parking in the parking lot. 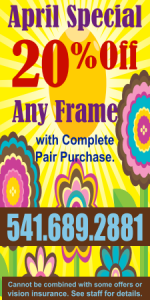 After hours, call 541-607-4318 for the optometrist on call.